I’ll refrain from the more gory pictures of chum and cigar minnows with their eyes stabbed out, ha ha. But here’s the boat’s catch. There were 10 of us fishing, so we each were allowed to take home two red snapper and many other kinds of fish as well. Dave’s biggest red snapper catch is on the farthest right of the top row, and my lesser amberjack is right next to it. Yep, I’m quite a bit behind, but I wanted to share Dave’s and my latest Florida adventure. While the kids were in the northeast visiting with the grandparents, on July 3rd we booked a half-day (6 hour) fishing trip out on the Gulf of Mexico. We had SO MUCH FUN (yes, I’m shouting this). 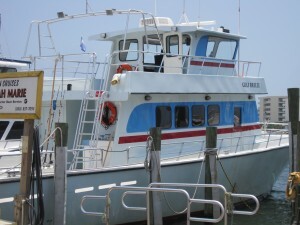 Our boat, the Gulf Breeze. 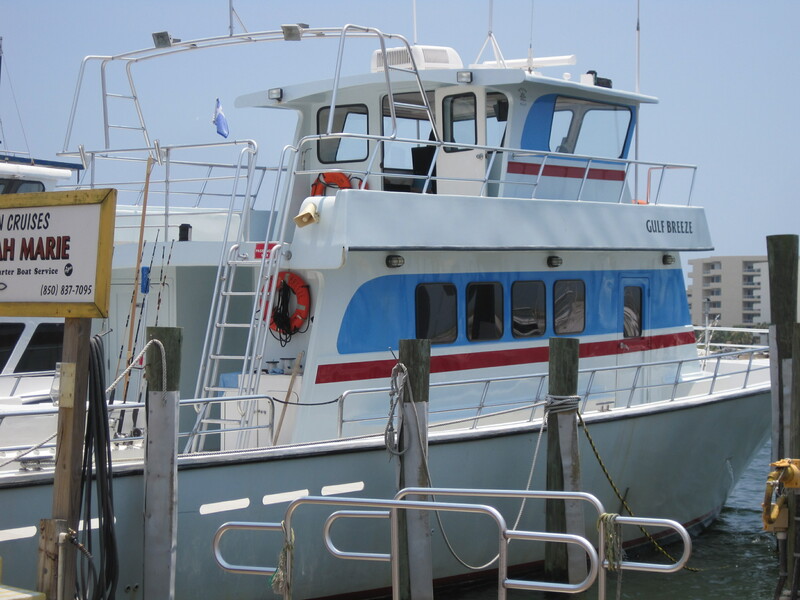 We chose Olin Marler Charter Boat service for our trip, since that’s the same company we used for our dolphin cruise in April. The Marler name is a fixture in Destin: “Uncle Billy” Marler was one of the founders of Destin and served as the fishing village’s first postmaster. The founding families’ names are everywhere in Destin: street names, company names and even tied into the names of the boats. 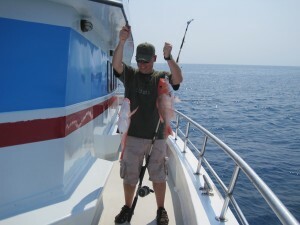 Olin Marler offers several options for deep sea fishing trips: the “party boat” which holds more people on the boat but costs less, the group charter: a smaller boat experience that accepts an assortment of smaller parties, and the truly private charter, where a single group pays for the full cost of the boat trip, regardless of how many people are in the group. We chose the middle option, since we didn’t want the chaos of a large group but weren’t about to pay for a full boat all to ourselves. Our group charter was able to accomodate up to 30 people on board, but there were only 10 of us. It felt very fortunate to not be on such a crowded boat. The boat set out promptly at our 1:30pm sailing time and it took us 90 minutes to travel out about 20 miles south of Destin. The water is beautiful out here, and the boat’s depth-measuring device was telling us that the average depth was about 100 feet. Dave and I enjoyed watching the clouds (storms were forming nearer to shore to our north and we had a spectacular view!) and the scores of flying fish. We tried so hard to get a flying fish picture for the blog, but to no avail. You’ll just have to look at one in action here (courtesy of BBC’s documentary Life, narrated by David Attenborough). We saw the fish in these numbers, flying perpendicular away from the boat as they seemed to escape us. Dave’s “two-fer” catch: two red snapper at once! Once we found a good spot, the mates would give us a briefing on how to use the reels and rods provided to us, they’d set out buckets of bait for us, and the boat captain would sound the horn signifying it was time to start fishing. 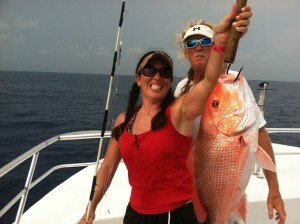 Folks had said the red snapper were in abundance when we were out, and they weren’t kidding. Dave caught three red snapper on his first two casts! I also had caught two red snapper. Ones that were too small were thrown back, and everyone on our boat had large fish up to our limits. We fished in several spots, and once we all caught our red snapper limits, the captain attempted to get us to a location with less red snapper and more of other fish that were in season: mahi, grouper or other types of snapper. But the red snapper kept coming. We had to throw back so many of them! Some of us had caught some other fish: I caught a good-sized fish that the mate called an “amberine”, which is apparently another name for a “lesser amberjack“. Dave and I caught several fish called “vermillion snapper” which we could catch in unlimited numbers. My big catch! By the next day my arms felt the workout from bringing up these fish! We fished from about 3pm to 6pm, then headed back just before sunset. The mates hung up our fish on a board for the tourists to see. Dave and I had been seeing many boats’ catches coming in over the past couple weeks and I think our trip had some of the biggest red snapper we’d seen all season! The mates will clean and filet the fish upon request, and Dave and I chose to do this. But in hindsight, I wonder if I should have attempted to take the whole fish home. There might have been more I could have done. When the mates filet the fish, you’re losing a LOT of meat. I could have made some great seafood stock from the remains. We had an iced cooler with us — there are no food or beverages on board so we brought our own. Once we consumed our beverages, we had room to take home the filleted fish. Dave and I brought home 11 1/2 pounds of fresh-caught fish: 1.5 lbs. of lesser amberjack, 1.5 lbs. of vermillion snapper and 8 1/2 lbs. of red snapper. Two days later my Mom came in town and we grilled some of the red snapper for her in foil packets with an assortment of herbs, lemon and soy-based marinades. Yummy! Can you see the dolphin fin over my shoulder on the left side of the picture? We had a fantastic time! I’m very glad we did this without the kids because they would not have had the patience to sit out on the boat for 6 hours, nor would they have had to strength to do any actual fishing — reeling in two twenty-pound snapper on the line was a brutal workout. I would have had to spend most of my time helping the boys, instead of enjoying my own fishing. I recommend this trip at least once for anyone spending time on the Florida Emerald Coast near Destin or Pensacola. There are hundreds of charter boat businesses in the area who are ready for an excuse to help catch fish! 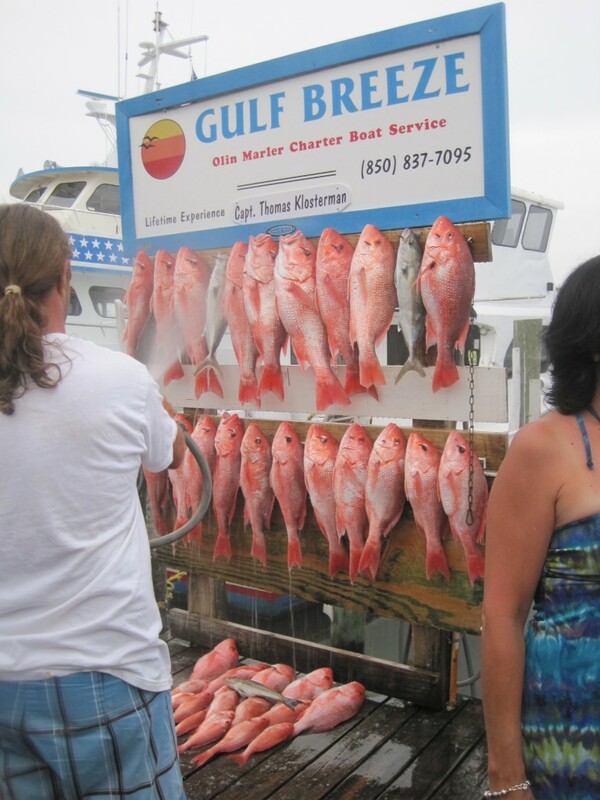 Here are some links to a random set of Destin and Pensacola Beach businesses that offer assorted-styles of fishing charters. I can only attest to Olin Marler’s experience, none of the others. 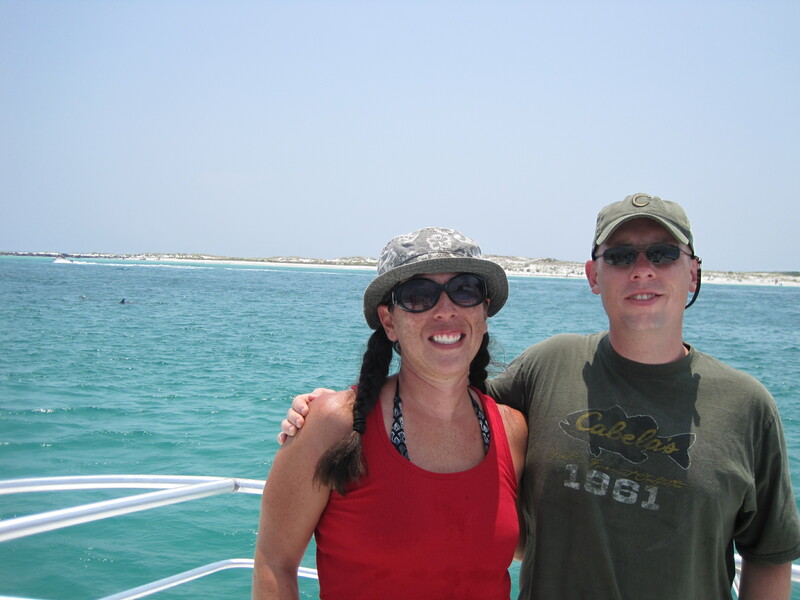 Simply Google “Destin Charter Fishing” or “Pensacola Charter Fishing” for more choices.